If you have been injured on the job, filing for workers’ compensation will mean that you will have to know and understand quite a few different numbers and figures. One of the more important ones is your average weekly wage (AWW), which is used in calculating your benefit amount. However, it can be very confusing for the average layman to try and do this, as there are multiple methods used to arrive at the right number depending on your specific situation. If you seek the help of an experienced workers’ compensation attorney, they can assist you in finding out all the necessary numbers. Under Florida law, if you suffer an injury on the job, and you seek workers’ compensation benefits, you will be given an impairment rating, which helps to determine how disabled you have become due to the injury. If your impairment rating puts you as temporarily disabled, your wage loss benefits will be 66 2/3 percent of your AWW. That benefit does include wages from more than one job, if you have them, as well as additional costs like uniforms, commuting costs, and even health insurance if your employer ceases to pay it while you are not working. It is important to keep in mind that this method of calculating payment only applies to those who have been judged as temporarily disabled. If your impairment rating places you at permanent disability, generally you would then pursue Social Security disability, as opposed to workers’ compensation, which is meant to be temporary. Also, if you are able to return to light duty, you may be entitled to fewer benefits in general. While your AWW is the major building block on which your benefit amount is calculated, it is only part of figuring out the total amount you are entitled to. Florida does have a maximum weekly benefit amount, so if 66 2/3 percent of your AWW is more than the listed maximum, it will be reduced to that max amount – for example, the maximum for 2019 is $939, so if calculating two-thirds of your AWW would put you at $1,000, your biweekly benefits will total $939. Another fact you should be aware of is that normally, there is a limit of 104 weeks in which a temporarily disabled worker can receive benefits. However, if they are later ruled permanently disabled, or if that two-year mark arrives and the worker has not yet reached maximum medical improvement (MMI, meaning that their injury is as healed as it will ever be), the limit is stretched to 260 weeks. If your condition changes, or your doctors inform you that there is no further medical improvement you can expect, you may be eligible to receive benefits for longer than those 104 weeks. 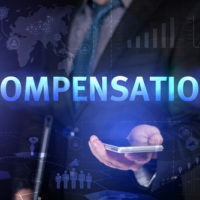 Workers’ compensation is a notoriously complex area of law, and the calculations that are often required can confuse even the most math-savvy person. Enlisting an Orlando workers’ compensation attorney to help guide you through the workers’ compensation process can save you considerable time and trouble. The knowledgeable workers’ compensation lawyers at the Hornsby Law Group are happy to try and assist you with your case. Contact us today to schedule a consultation.